The Butternut Squash Project Cont. Two squash down, two to go. Squash No. 2 went into the crockpot this morning and came out as delicious Butternut Squash Soup. This recipe came from my fabulous new cookbook, "Make it Fast, Cook it Slow" by Stephanie O'Dea. If you didn't get to follow along on Stephanie's blog , it's OK. She is still cooking in her crockpot and still blogging about it. Oh yeah, and she just had a baby! 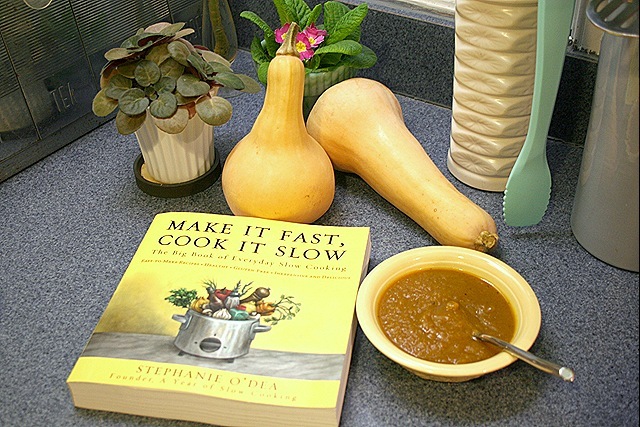 Stephanie's blog project was to cook with a crockpot every day for an entire year. Her blog has to be one of my top five reads. The cookbook is a must have. Stephanie's Butternut Squash Soup was a cinch and it's quite fabulous tasting. How is it possible that I do not have that cookbook? I give you big credit, Suzy, for tackling all of these squash projects. There is something very sweet about your Mama giving you food. Thank you the link to her blog, I just bookmarked it. 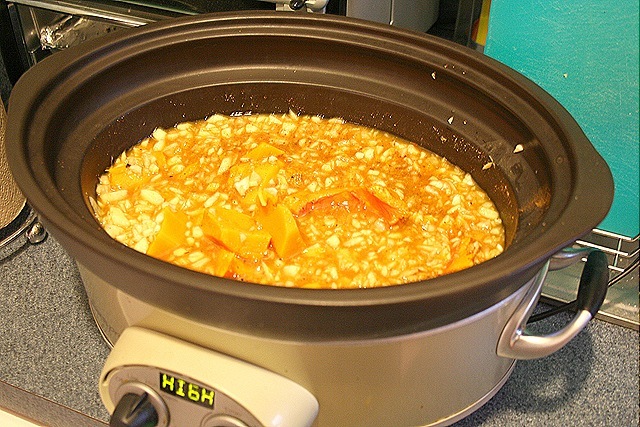 I have a slow cooker that rarely comes out of the cabinet because I don”t have any good recipes. I will definitely be trying some of the ones on her blog. I have an award for you on my blog. The rules of the award are pretty simple. Tell who gave you the award, share 7 things about yourself that people probably don’t know, and pass it along to 7 blogs that you enjoy. I loved your posts during the Vintage Christmas Mondays party and would love to share you with my readers. Thanks for inspiring me to make soup in the crock today. Maybe I’ll even put some squash in it. A crockpot is definitely one of the best things a mom with a new baby can have. Actually, it’s one of the best things anybody can have! I prepare butternut squash in the microwave, and then add butter and honey & mash it together. I have so many slow cooker cookbooks, all of which tend to collect dust because my dh groans each time it is retrieved from the shelf. We’ve had little luck with it. Perhaps this blog/recipe book will make a difference? !